Creates a gentle cushion for cabinet doors and drawers. Also useful as feet for small boxes to prevent slipping and scratches on furniture. Perfect fit for my Kraftmaid cabinets. Finally found some. Looked at all the stores in my area. Thank you. perfect replacements for our cabinets. They screw in and stay in place. We just had the cabinets redone and they were exactly what we needed. THEY WERE EXACTLY WHAT I NEEDED AND FIT PERFECT REPLACEMENT. VERY TIGHT IN THE EXISTING HOLE. Replaced the feet on a lazy susan. Worked better than the original feet. These stick to the surface when turning the lazy susan. The original feet were slippery. Thank you for a great product. 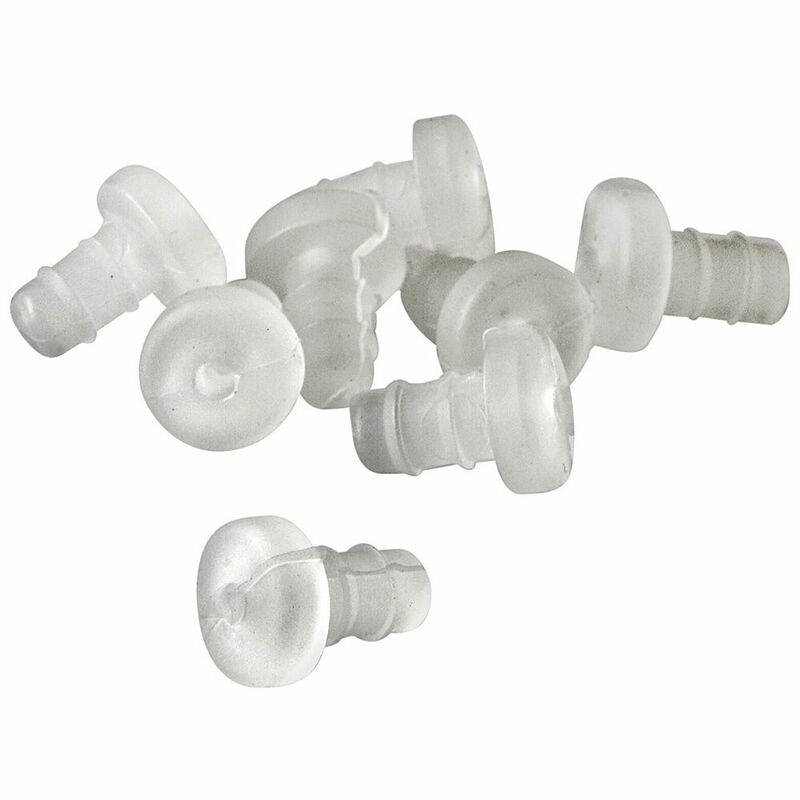 Perfect replacement for rubber stoppers that come with kraftmaid cabinets!! Better than the originals!! The extra step in cabinet production of drilling more holes in each door and drawer front is extra effort well spent. These bumpers will not eventually move, or fall off, like the stick-on variety. I add a small drop of epoxy in the hole before driving the bumper home. The epoxy may be over-kill. These bumpers replaced long deteriorated bumpers on a glass patio table. I needed the smaller stem diameter and these were perfect. The glass top is now cushioned from the metal supports the way it should be. just what I needed; just as described. They are the best thing for longevity and for cushion. A little hard to insert, which also means they won't come out when you don't wan them. Just as expected. Delivery was timely. Happy with the purchase. I always use these in the place of stick-on type felt or rubber. They wont move or fall off over time. The product worked as advertised fitting exactly. I like the bumpers but they do come out. Wish I could find a way to keep them in!! Had our Patio Furniture powder coated and they came out beautiful. Only problem was the bumpers for the glass top. Rockler didn't let us down. We Have ordered items in the past that couldn't be found locally. Found the items on line, ordered them and they worked perfectly. Again, Rockler to the rescue. Couldn't be better. Arrived as promised and did the job. will always use ROckler in the future. Have a glass top for a beer keg table. The bumpers fit right in the holes in the keg top and give soft support to the glass. Perfect. These were for a customer with stock cabinetry and they worked perfect. Highly recommend. Work great - fit glass-top outside patio furniture! Not to hard, not too soft. Much better than stick -ons. bumpers worked like a charm. We needed to replace the bumpers in our cabinets and not only were these perfect, but the best price on the internet! Bumpers made a nice finish to a couple of cutting boards that were given as Christmas presents. I used them as nonskid, low-profile feet for a project and they worked great. Bought these as replacements for glass table top replacement bumpers on my patio furniture. They are the perfect choice for fit and cushioning. the price can't be beat either. Works good on replacing ones on outdoor patio furniture. Love these. Soft silicone gives soft relatively quiet close and they don't fall off over time like adhesive backed ones do. Soft-stem drawer bumpers should be the industry standard for cabinets. I am an architect, and I have begun to specify soft-stem bumpers for all my projects. They never fall off, as the stick-on bumpers do. The bumper I was looking for. These bumpers are perfect for my new cabinet doors. I actually use these as hidden feet for shelf style clocks. Provide good surface grip and scratch protection for the style clock I make. Perfect size for small projects, and they stay in place! Drawer stops, door stops, small box feet, cutting board feet. Forget the adhesive ones that slide off after a while. These are just the right durometer (hardness) to keep things from slipping on a counter top or to soften a door closing. Just drill a hole, pop 'em in and you're done! I've used tons of these, highly recommended. Great product for my cutting boards they don't leave any marks on tile, marble etc. Only problem was that the two packages I received only had 7 in a package not 8.Editor's note: our customer service team at 800-376-7856 is available to assist with getting that missing one out to you Brandon. Although a bit &quot;firmer&quot; than the stick-on type I'm replacing, these bumpers stay in place! The clean-up of the glue residue from the stick-on's takes longer to remove than installation of the new ones. My first purchase of the soft-stem bumpers was for a cabinet project, but since then I have found multiple uses for this simple high quality designed product such as foot pads for small items and cushions between moving components. The stem locks firmly in the mounting hole, yet can be easily removed when needed for project finishing or replacement. I keep my shop well stocked. I recently tried to find cabinet door bumpers at [local home centers]to match my existing bumpers on my Kraftmaid cabinets. They said they don't carry them but they could order them. Kraftmaid changed there door bumpers and don't have the kind I need. Rockler did at a great price. I have 4 metal frame tables with glass tops.I used these 3/16 inch soft stem bumpers for the glass to sit on.How ever I would like some that would fit into a 1/4 inch hole, that would make my day. Very easy to use and effective. Better than the stick on kind. Things that go bump all the time! They work as intended, easy to fit. Although they are a little bit (not much) thinner than our original bumpers for our cabinets, these worked just like the originals. We are happy with the purchase, and because we ordered 2 sets, we should have enough to replace any that are lost in the future. I needed low profile, non-scratching feet for a serving board. I didn't want stick on, so these worked quite well. I was unable to fully seat the bumpers using the recommended 3/16 diameter holes, even with slight chamfers. I increased the hole diameter to 13/64 and was able to install successfully. The bumpers, being soft, are able to compensate for slightly uneven surfaces. Replacing old and dirty ones. They were what I needed and do there job. Issue I have is a lot of them weren't cut cleanly and I had to do a lot of trimming of the rubber. Other than that, they are what I needed and look/work good. Some have fallen out of our cabinets. I would like replacements. Replacing old ones. They work great! These are the best bumpers ever! They do not deteriorate in humid weather and once inserted they stay put. Also, they nicely deaden the sound of the door closing. Great product! recommended by store i purchased chairs from as replacements for the ones that keep falling off. I need to replace broken off bumpers on a glass top patio table. These seem to be the right size. I have used them before and I think their great. These bumpers are on my kitchen cabinets, and they are great. I'm having two additional cabinets built and want these same bumpers on them. I was glad to locate them at Rockler. Using the for "Trivet" feet. Used them before. They do the job well. Self-adhesive bumpers either do not stick or move around on cabinet doors. Want a permanent solution. Worked well in the past. have dinning table needs bumpers. Worked best for the project I am doing. Used antique corner cabinet I bought did not have the rubber bumpers for the glass shelving. Required to renew patio table . bumpers do not slip off and are soft and quiet when cabinet doors close. I looked everywhere in this town for these! Thank you for carrying them! Replacements for new cabinets. Much better than the stick on bumpers. perfect bumpers, better than stick ons. Because I have used them in the past and they are a great product. These are the bumpers used in my cabinets and I needed to replace those that are missing. All my cabinet doors and drawers use them and some are missing, best way to quiet the kitchen or laundry. Do these replace the stem bumper glides which are no longer available? Will Loctite superglue hold these bumpers in place (the ones I have been using have a tendency to pull out occasionally)? BEST ANSWER: I use brad point or Forstner bits and none of mine have ever fallen out. They should be hard to push into the hole. Glues or adhesive will work if the holes area little too large. I have tried superglue and it worked just fine. Another option is clear silicon. I have a Hampton Bay table, removed the glass top bumpers to paint table & promptly misplaced the bumpers. Holes are 5mm diameter, less than .25". Will these work? BEST ANSWER: It probably should. May be a little loose but with glass on top they won't go anywhere. We lose some of ours when we put ours away for the winter. That is why I bought about 5 packages. Good quality bumpers. I used on my kitchen cabinets I refinished. Should work just fine for your application. They should. 5 mm is approximately 3/16" which is the stated stem size. My bumpers get soft and gooie over time, do these? BEST ANSWER: I've used these over the last 10 years on two different homes and have not noticed any degradation. No, he has been using them for years and has never had that issue. Will these fit in the holes on the Hallmark Cabinets? BEST ANSWER: I don't have those cabinets. I have Kraftmaid. I can't tell the dimensions of the stems. But if they are too long or too thick you can shave a little to make it snug. I'm not familiar with the Hallmark Cabinets. Hopefully someone can find the answer for you.